That last one I have been looking for in used bookstores for about six years, with no luck. Thanks to the popularity of Game of Thrones, it's been reissued and ended up in my stocking. Now, it's a hot cup of coffee, a fire in the hearth, and some good entertainment. I wish you all the same! At long last sir[s], have you no decency? For Jim Walden, Iris Weinshall, Norm Steisel and the rest if the gang, the answer is no. No shame, either. Perhaps evil is a strong word but it does make for a nice turn of phrase. There has long been consistent, strong and reasoned opposition to building condos in the park. Park space is scarce enough as it is, it's a tenuous financing scheme, it amounts to a quasi-privatization of parkland. It also happens that the park will flood during a storm surge, as was made abundant clear by Hurricane Sandy. The Bloomberg administration has remained stubbornly wedded to the idea of a self-financing park. The recent storm experience gives the Mayor an opportunity to rethink his position, and I hope he takes it. And if we just can't shake the concept of a self-financing park, a version of the re-zoning finance plan offered up by Senator Squadron could make it work, without shoehorning condos into parkland. * The case of One Brooklyn Bridge Park is an exception. Leaving a solidly constructed existing structure actually makes economic sense. Sometime in Q1 2013, we're told. I'd read that as "late March". Street intersection while adding bike parking. Nice. A 50 year old folly, soon to be compounded. a repeat if this disaster. noticed "mallow" as an herbal ingredient in my Ricola cough drops. Brooklyn Bridge Park Footbridge Getting Installed! Brownstoner's got pics. Can't wait! Crazy. DOT is going to implement a "slow zone" in Boerum Hill. Perhaps it's time to consider one for Carroll Gardens and Cobble Hill as well. A 20 MPH speed limit on residential streets improves street safety and quality of life for residents. Population and transit ridership have skyrocketed over the last twenty years in Brooklyn, but the New York City Departments of Transportation and City Planning have yet to develop a plan to accommodate increased demand on the borough's transportation infrastructure. A group of elected officials, civic groups and advocates are bringing attention to the matter with today's release of BK Gateway Transportation Vision, a report that highlights the challenges facing Downtown Brooklyn and the need for a comprehensive transportation-land use plan for the area. and an expanded protected cycling network, paricularly along Flatbush and Atlanic Avenues. The Vision grew out of discussions with community boards and after a community charrette last March and ongoing community outreach will continue to identify areas of concern within the Gateway area. A follow-up community meeting is expected to take place on Saturday, January 26. "Tell me again how that person won’t miss her Medicare"
"Here's the thing, once again: all of this is unnecessary. The deficit caused by Bush's tax cuts, wars and recession will be largely mitigated by reinstatement of the upper income taxes, drawdown of the wars, growth(duh!) and, most importantly, controlling health care costs, the best method for which would have been expanding Medicare to cover everyone. We don't need to make this "clever" accounting change that will result in elderly and disabled people suffering. .... (Hell, we could even raise the top income tax rate above the Clinton levels, at least for those making a million dollars a year. These people have been making out like bandits and surely won't miss the money.)" "Tell me again how that person won't miss her Medicare"
What you're seeing is life expectancy at age 65 broken out in to the top half of earners and the bottom half of earners, from 1977 to 2007. 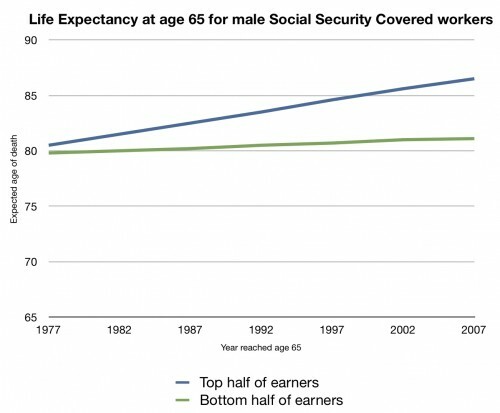 I got these data from a study that appeared in Social Security Bulletin in 2007. The paper was entitled, "Trends in Mortality Differentials and Life Expectancy for Male Social Security-Covered Workers, by Socioeconomic Status." We know that average life expectancy went up less than 5 years overall in this period. But what's somewhat stunning is how much of a disparity there is in these gains. 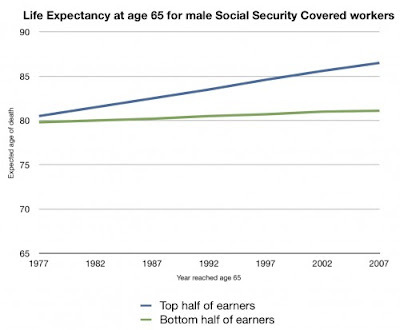 The top half of earners gained more than 5 years of life at age 65. The bottom half of earners, though, gained less than a year. If you raise the age of eligibility by two years, then you are taking away more years of Medicare than half the country gained in longer life. Moreover, we've already taken away these people's Social Security. The Greenspan Commission in the early 1980s made it so that the retirement age is already 66. It's scheduled to rise to 67. So those at the bottom half of the socioeconomic ladder have already lost more years of Social Security than they've gained in years of life life expectancy at 65. Sure, in a perfect world poor young seniors could get Medicaid if we take away their Medicare. That is, of course, if their state accepts the Medicaid expansion. Many haven't. Less poor young seniors can go to the exchanges, I suppose. But if you're a 65 year old widow and you make $46,100 a year in a high cost area, then your premium will be over $12,000 for your insurance. And you could owe another $6250 in out-of-pocket costs if you get sick. Tell me again how that person won't miss her Medicare. So, we know that raising the Medicare age is a bad idea. How about the other very "clever" idea floating around these discussions: changing the accounting formula to cut benefits across all federal programs? It's a benefit cut. It's not some minor technical change to the COLA. It's a real cut to the benefits you have earned every year into the future. It cuts benefits more with every passing year. After 10 years, your benefits would be cut by about $500 a year for the average retiree. After 20 years, your benefits would be cut by about $1,000 a year. It hits today's Social Security beneficiaries. Politicians like to say that their cuts to Social Security will not affect those getting benefits today. Wrong! Switching to the chained-CPI would hit all current beneficiaries. We need a higher COLA, not a lower one. The current COLA is not large enough--it does not adequately account for large health care cost increases faced by seniors and people with disabilities. And it's not just social security. It's veterans and military retiree benefits, disability payments, federal worker pensions, anything the federal government funds. If you know any veterans or military retirees, you might want to pass this fact sheet along to them. They tend to get testy when their promised benefits are threatened. They are a constituency worth organizing against this. New York City hosted the 1939 World's Fair in Flushing, Queens. To show off the city's water system that tapped mountain springs as far as 100 miles away, the Cartographic Survey Force, a branch of the Works Progress Administration, constructed a 3-dimensional model of the system out of wood and plaster for @ $100,000 (about $1.5 million in today's dollars). Measuring 32 feet by 20 feet it never made it to the Fair and instead was put into storage; some said it because it was too big, but others have said it was to protect the City's Water system from spies as the country was beginning to contemplate war. It was shown once in 1948 - at the city's Golden Anniversary Exposition - and then forgotten. In 1991, DEP's chief architect Michael Cetera discovered it sitting in the Jerome Avenue Pumping Station (built 1906) when he was charged with renovating the landmark building. The map was in rough shape after 40 years of neglect. In 2006, it was restored by McKay Lodge Conservation Laboratory in Ohio and has been on display at the Queen's Museum since 2008. You can now see the map for yourself and hear about its story from NYC water educator Matt Malina. This is a family friendly event. The Queens Museum also has a scale model of the entire city that is not to be missed. This event is free with a suggested $5 entrance fee to the museum. Brad Lander in the news again with a sensible call for bus countdown clocks. The benefit to countdown clocks is disproportionate to their costs. reduction in stress and agitation is huge. I'm just going to take this full post, and say I concur. I'm all for more trains everywhere, but instead we should really be encouraging (and by encouraging, I mostly mean allowing) infill development around stations instead of spending immense amounts of money on parking. Philly has a very extensive commuter rail system, and plenty of the stations are in places which are almost-sorta-kinda-walkable, but the big parking lots around the stations don't help that. Zone for multi-story, multi-family mixed use around the stations. That's the way to get more riders. On Thursday, the SEPTA board approved spending up to $282,788 for 4.86 acres owned by real-estate developer Wolfson Verrichia Group Inc., of Plymouth Meeting. The deal is still in negotiation, and the board on Thursday authorized SEPTA officials to acquire the property rights by condemnation if the developer declines to sell. "We've had numerous discussions, and it's our intention to amicably acquire it," said SEPTA real estate director Gerald M. Maier. About 3.5 acres would be used to build a 600-space parking garage, and 1.3 acres would be used for an access road to connect with U.S. 1, Maier said. Parking constraints at many stations are real, but the solution isn't more parking. It's more people being able to walk. It's smart development policy to revise our property tax calculations - at least in an urban environment where development is a desirable good. Cheap land taxes mean that a speculator can park (pun intended) a desirable property for decades gambling on a big payday, to the detriment of the surrounding community. It doesn't have to be that way. and moderately dense complement each other. Nice restoration and improvements. I'm looking forward to the finished product. I'm looking forward to taking the bridge from Squibb Park over to the waterfront. It will make a nice loop for a Promenade walk and return via BBP. Fun to watch. MTA should do more of these! It's pretty dramatic. What will happen to prices when rates go up? Hint: don't expect another meteoric rise in housing prices any time soon. Assuming the Fed ever raises rates again, or backs off their QE efforts, mortgage rates will rise putting a significant break on home prices. pain when the winner turns out to be a really impressive talent. Fascinating story. I've long been of the opinion that our clandestine services are a fount of organized crime and corrosive to an open society. And while intelligence gathering is a necessary and legitimate function, the whole directorate of operations is essentially a state-sponsored criminal enterprise. But it does make for some fascinating stories. Of course the unmentioned historical figure that this story brought to mind was Sirhan Sirhan. Theater chain moving in to City Point that pairs movies with food and libations.